Spanish Legal Forms. Drafted by Lawyers. Fast, easy to use and legal. 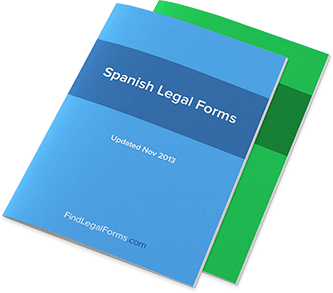 Spanish forms for your personal, business and legal needs. All forms include English translations. Various business forms available in Spanish. These attorney-prepared forms include employment agreements, bills of sale, promissory notes and service agreements. Spanish Bill of Sale forms covering transactions such as the sale of a car, electronics, jewlery and more. Various business forms in Spanish (with English translation) including asset purchase and business plan confidentiality agreements. Employment related forms in both English and Spanish including employment agreement forms, applications, and forms for use by employers and employees. Various leases and related forms in both Spanish and English. Contracts in Spanish with English translations used when hiring an individual or company to provide services such as pool cleaning, catering or website maintenance. Notices to Quit or Vacate (Spanish) Written notice, in Spanish, from a Landlord to a Tenant who has failed to comply with an obligation under the lease. Service Agreement (Bakery) - Un Contrato de Servicios de Diseño de Panadería/Pastelería [Spanish Form] Bakery Services Agreement for use in all states. Contrato de Servicios de Panadería para uso en todos los estados. Service Agreement (Caterer) - Contrato de Servicios de Banquetes [Spanish Form] Caterer Services Agreement for use in all states. Contrato de Servicios de Banquetes para uso en todos los estados. Employment Form Combo (Spanish) Get 2 forms for just $39.95. Save -0%! Employment Form Combo Package in Spanish. Landlord & Tenant Forms Combo Packages (Spanish) Get 6 forms for just $39.95. Save 65%! Our most popular Landlord and Tenant forms in both Spanish and English.